On July 30, the classic crossover tenor, singer-songwriter and celebrated recording artist will return to his hometown in Tuscany to play at Teatro del Silenzio. A decade ago, Bocelli convinced the local government to construct the open air amphitheater, which with his backing was completed in 2006. Bocelli returns once a year to perform his flagship concert, and the venue remains silent for the rest of the year, hence the name (theater of silence). 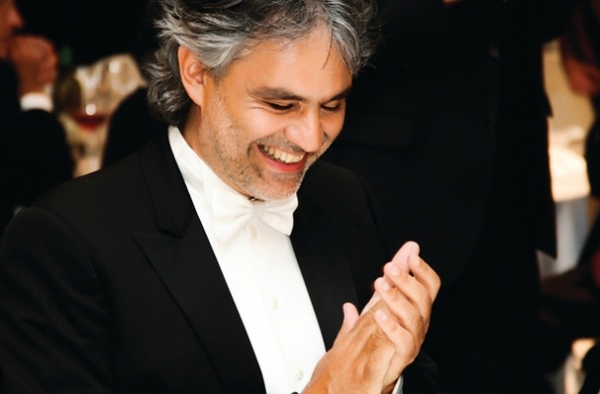 To date, Andrea Bocelli has recorded 9 complete operas, 14 solo studio albums, and 3 greatest hits albums. He has sold over 150 million records worldwide and has been nominated for a Grammy, Golden Globe and Academy Award. In 1999, Bocelli won a Golden Globe for Best Original Song for his duet with Celine Dion “The Prayer,” and was nominated for an Academy Award for the song produced for the animated film Quest for Camelot. Bocelli’s success is marked not only by the number of records sold, but also by his triumph in bringing classical music to the top of international pop charts. With the release of his classical album “Sacred Arias,” Bocelli achieved a spot in the Guinness Book of World Records for simultaneously holding the top three positions in the U.S. Classical Album charts. Seven of his records climbed to Top 10 in the Billboard 200, and a record-setting ten have topped the classical crossover album charts in the U.S.
Born with poor eyesight, Bocelli became permanently blind at the age of 12 after a football accident. His musical talents became apparent during adolescence, wining a song competition at age 14. He continued to play small shows during his university and law school years, but it was not until 1992 that he catapulted to national stardom. Italian rock sensation Zucchero held auditions to make a demo of his song “Miserere” to send to Italian tenor Luciano Pavarotti. After hearing Bocelli’s tape, Pavarotti insisted that Zucchero use Bocelli instead of him to record the song. Bocelli recorded dozens of albums, both solo and compellation, over the next few decades. He continued to dazzle fans around the world, and was named one of People’s 50 Most Beautiful People in 1998. His 10th anniversary concert this summer is truly the show of a lifetime, don’t miss your chance to share in the magic!